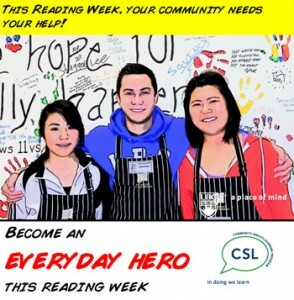 What are you doing for Reading Week? Give back to your community during this year’s Reading Week, Days of Caring! Meet new people, challenge yourself, build your resume and make a positive impact. The Community Service Learning Program has organized a series of one-day volunteer opportunities for interested students from February 9 to 13. The Community Service Learning Program has organized a series of one-day volunteer opportunities for interested students from February 17 to 21.